Windham, CT. c.1850. Excellent small example of Italian Villa style, with its characteristic square tower, or campanile. 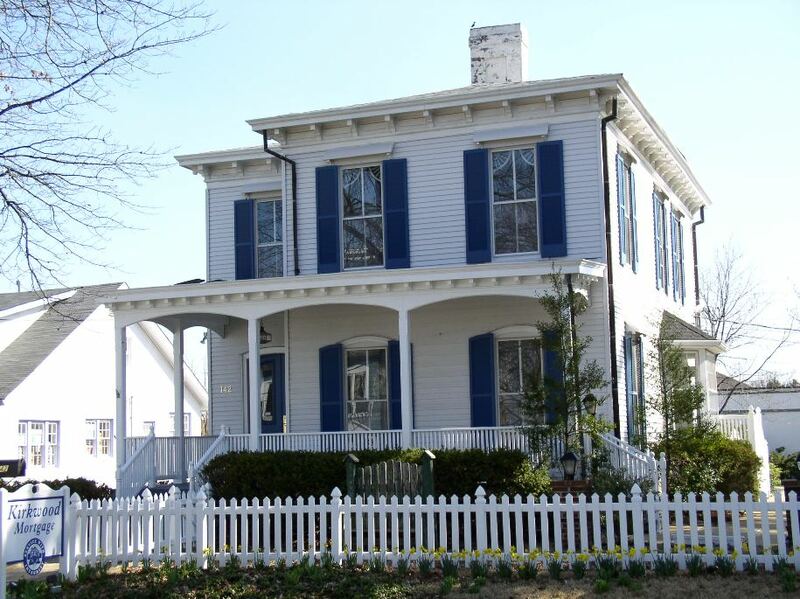 Also includes a typically light-framed Italiante porch, tall windows, overhanging eaves, and decorative brackets. PERIOD OF POPULARITY: 1850s through 1870s, later in the West. 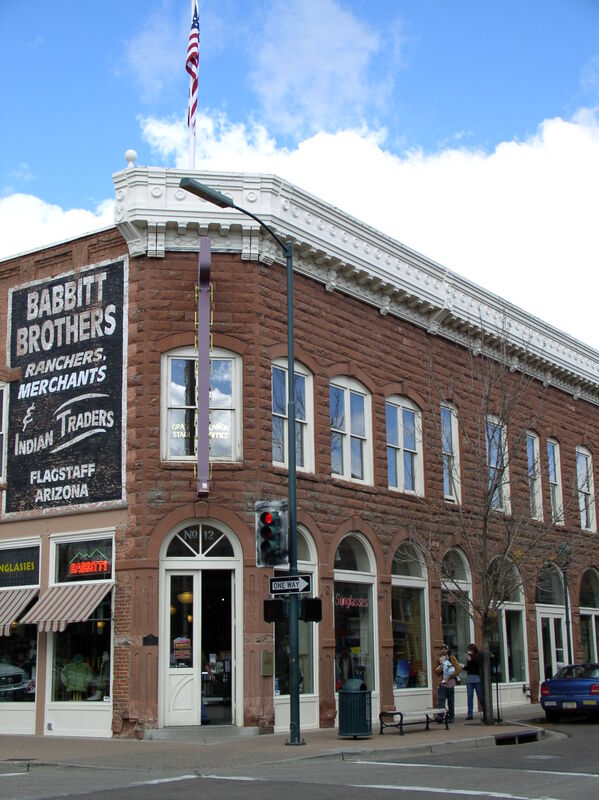 Commercial buildings through 1880s. 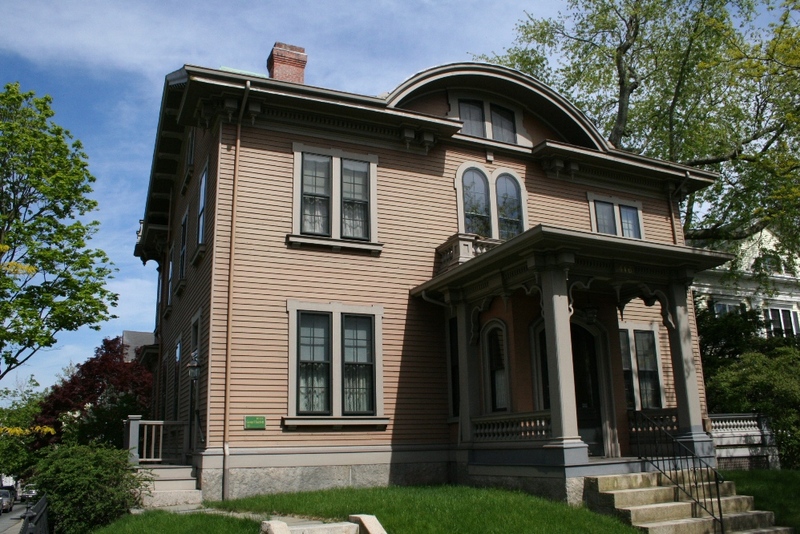 IDENTIFYING FEATURES: 2 or 3 stories, rarely 1 story; low-pitched roof, widely overhanging eaves; large, decorative brackets under an ornamental cornice; tall, narrow windows (most often on commercial buildings), commonly arched or curved above; an occasional square cupola or tower (campanile), elaborate wrap-around porch (or smaller entry porch) with decorative Italianate double columns. BACKGROUND AND INSPIRATION: This style dominated American houses, in both urban and country settings, between roughly 1850 and 1870. The style was popular as cities and towns were settled across the Midwest, making Italiante a common sight in such places. It was also popualr in the still-growing older cities of the Northeast. The style was least common in the South, and very common in San Francisco. The style diffused into the U.S. from England as part of the Picturesque (Romantic) Movement which surfaced in the eastern U.S. as a reaction to formal classical ideas and orderly Renaissance planning. Emphasizing the rambling, asymmetrical character of Italian farmhouses, the style easily fit into the informal, rural ideals of picturesque movement. Because of the increasing complexity of American building types by the 1850s – from train stations and commercial buildings to townhouses, apartments, and suburban homes, the style was modified to fit a building’s particular function. The style’s use for many of America’s main-street commercial buildings provides for one of America’s most distinctive symbolic landscapes of midwestern town centers. Like Gothic Revival, Italianate and its cousin, the Italian Villa style, was heavily promoted and popularized by Andrew Jackson Downing by the 1850s as the preferred suburban country house. 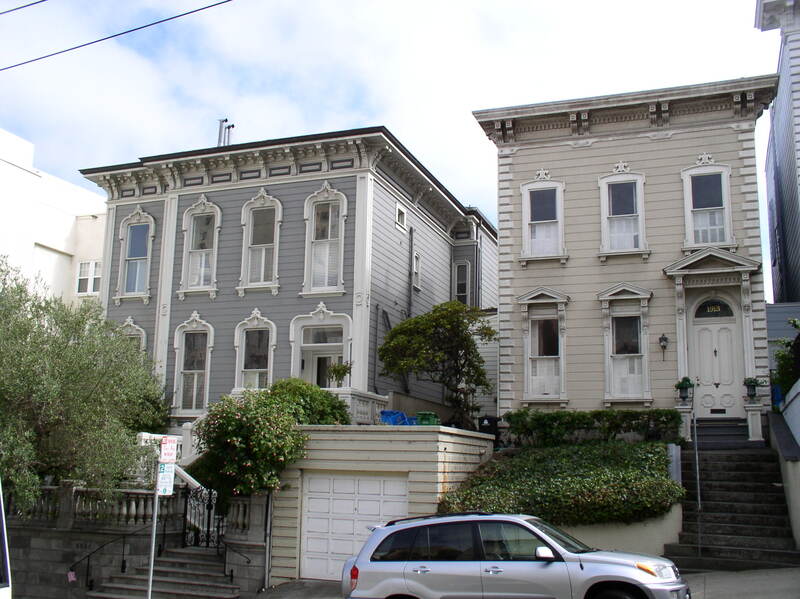 By the 1860s, Italianate overshadowed Gothic Revival as America’s most popular romantic style. 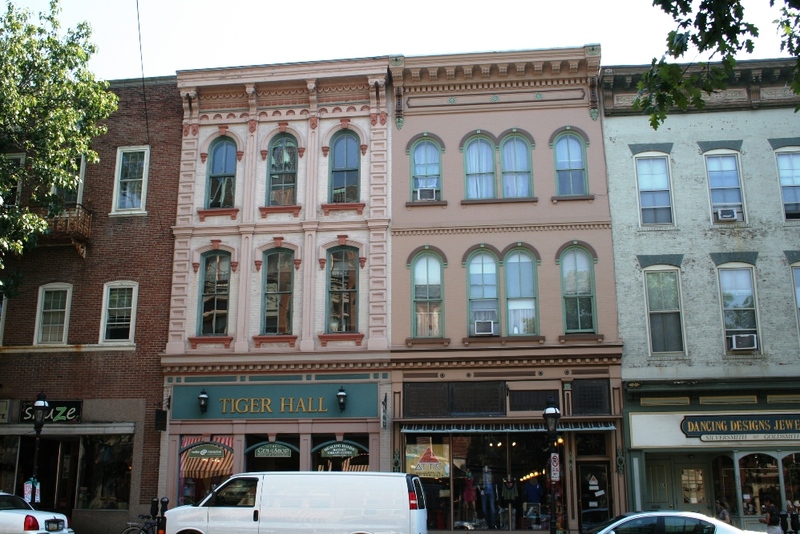 Bethlehem, PA. Four variations of Italianate main-street commercial buildings, probably c.1860s. Flagstaff, AZ. c.1888. A fairly typical Italianate commercial building like those found on smaller main streets throughout the country. Kirkwood, MO. 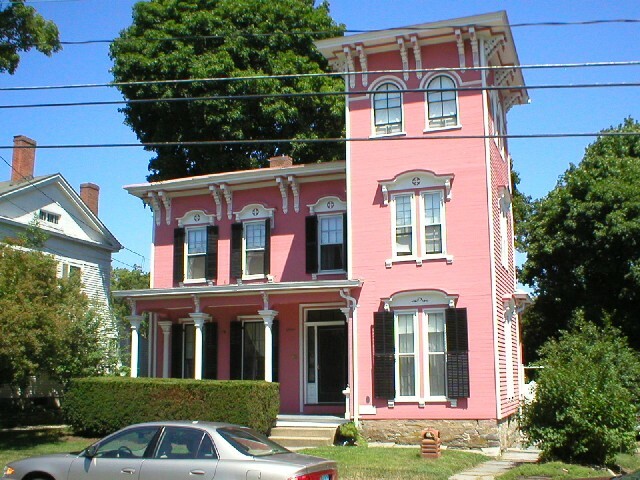 A common Italianate home with its boxy shape, two stories, flat roof, eaves with brackets, and thin-columned porch. New Bedford, MA. James Hammett House, c.1856. Features a central cross gable with Italianate cornice and brackets, Italianate-style porch, and paired or double-arched windows. Las Vegas, NM. 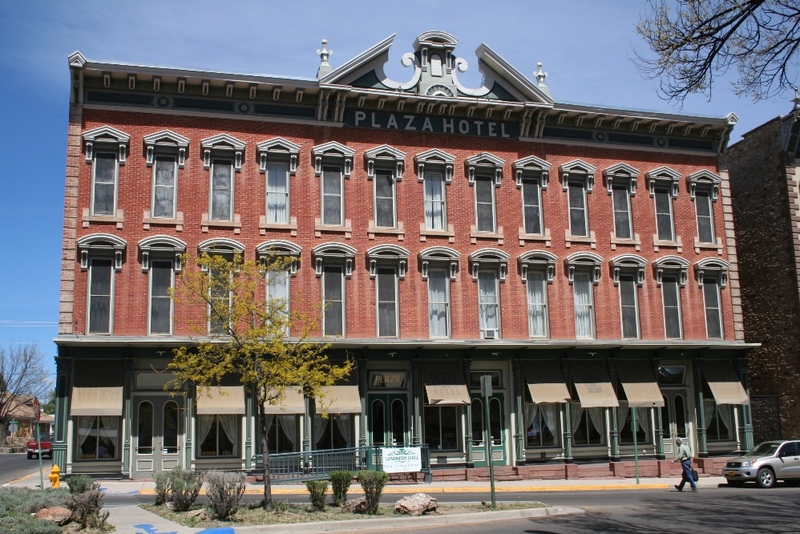 An Italianate hotel on the old Spanish plaza, exhibiting pedimented, tall windows, a broken pediment above the roofline, and elaborate brackets under the cornice. San Francisco, CA. Urban Italianate townhouses with tall, framed windows, overhanging eaves, elaborate brackets, and boxy, 2-story form. New Bedford, MA. Ivory Bartlett, Jr. House, c.1857. 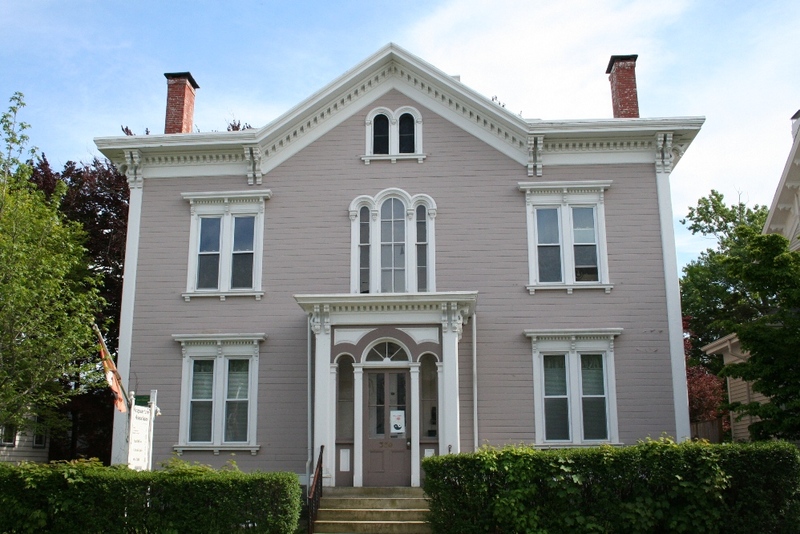 Includes the Italianate entryway and porch, double-arched windows on second floor and side gable, and pendant brackets (rare) hanging from the eaves. Also exhibits a central dormer with elliptical arch, reflecting the curved pediment of Italian Renaissance architecture.